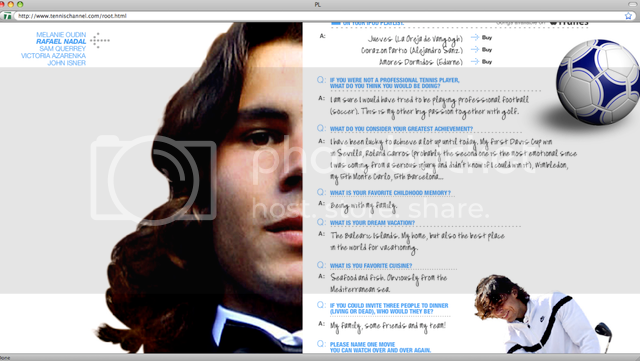 Tennis Channel has teamed up with Apple to launch a new suite of interactive features under the name, Players Lounge. Tennis Channel hopes to reveal athlete personalities through the online destination where tennis’ top players answer personal questions about their off-court lives. Viewers also will have the ability to download players’ favorite songs directly from the Lounge through iTunes. The first live chat will take place with Melanie Oudin on November 11th at 4 PM. Fans will be able to ask questions at www.tennischannel.com/oudin_chat. Tennis Channel's ad partner for the Oudin chat is Teen Vogue.